Lama Jigmé Namgyal was born into a nomad family in Golog, in the eastern part of Tibet, where he studied Buddhism from a young age. His root teacher was Khenpo Jigme Phuntsok, with whom he studied at the university of Serthar Larung Gar. After consulting his teachers, Lama Jigmé Namgyal decided to leave Tibet for Europe. This was a huge step, since he didn’t speak any European languages, nor did he know anything about European culture. While working to earn his living here, he quickly learned English and gained insight into the culture. 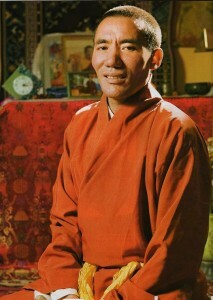 He founded the Tibetan Cultural Centre in Luxembourg and another centre in Rotterdam (Phuntsok Chö Ling). Apart from being a teacher of meditation, Lama Jigmé has much experience in spiritually accompanying the dying and is also deeply interested in interreligious dialogue. Through his pithy sense of humour, he is able to connect with his Western audience in an open and direct way. He has the unique gift of communicating an experience beyond words.